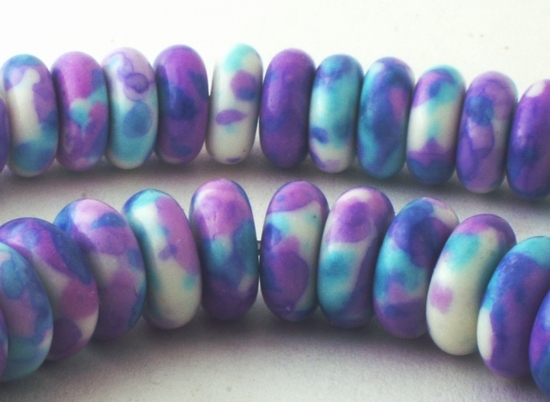 Sorry, we are currently sold out of '120 Invigorating Lavender & Green Calsilica Rondells Beads'. Please check back later. Price is per 16-inch strand of these amazing beads. Each measures 8mm x 3mm - about 120 beads to the strand. No two of these dramatic stones are alike! Rainbow calsilica’s mysterious eye-catching, vivid and varied colors, capture the imagination of jewelry designers. Each of these new stones is unique in its configuration of color. Because of this, many gem dealers speculate whether it occurs naturally or is manmade. The stone’s dramatic variation in color with its short history attracts attention everywhere. Lots of bright colors are great in summer jewelry, bringing bundles of energy to the wearer. This beautiful material deserves at least the same respect as much-more expensive natural gemstones.